Matthew Sapaula's Money Smart Radio » Blog Archive 130,000 Illinois Students Got Denied College Financial Aid - Will You Fall in this Trap? 130,000 Illinois Students Got Denied College Financial Aid – Will You Fall in this Trap? Do you want your 8th-12th grade student sitting in this same position when it is time for them to apply for assistance? Do you have a plan, at least in your head, how you are going to help your child through college? Have you gotten confused how the college planning process works? Well, we devoted a whole week on this topic during our daily radio show. We had top college planning experts in the country dropping their words of wisdom on how parents can really make their child’s dream come true. Click HERE to listen to those replays. For some people, they have their child’s college paid for already. They may have a trust fund established, grandma and grandpa flippin’ for the tuition bill, mom and dad may work at the college themselves so their education is paid for. That’s great! However, for the common folk like me, who had nothing but a middle-class upbringing and completely unaware of his options as high school student…we have more work to do. I thought playing football, basketball and running track was going to get me a scholarship to college. Although I had many offers, I didn’t know how to negotiate them and what questions to ask. Boy, was I wrong about a lot of things! Last week, as I was having my morning cup of coffee, I read about people like, Melanie Ramirez, a young lady that happened to make the front page of the Chicago Sun-Times, rejected by Illinois state financial aid. Why? After all, she is a Latina, she should be at the top of the list for aid, right? Wrong. Incorrectly filled out applications and lack of timely submission was part of everyone’s problem. It didn’t matter what ethnic background you came from – DENIED was your answer. Click HERE to read this full-page article in the Chicago Sun-Times, it even made USA Today! I tell you, the feedback we received from our radio show and email comments were amazing! People wanted to know more about how to navigate through these tough times, especially since college planning does affect your retirement planning. How are you doing on that “wisdom” that Tim suggests? Whose mistakes are you learning from? Yours? If so, then it is too late. Just like retirement planning, making mistakes in planning for college can be irreversible and only costs you more money down the road. According to the Boston Globe (10/2008), the average college student today is graduating with an average of $20k in debt. Is this how we set up our kid’s for success? In drowning debt? 1) PLAN EARLY! – Consider this your back-to-school special…getting the books, pens, pencils and new outfits are the easy part! Discover what you child’s unique passion, ability and desires are. Encourage them to be MORE of what they want to be based on their God-given natural talents. Don’t be like my Filipino family who frowned upon anything else that did not involve being a doctor, dentist, engineer, attorney, accountant or…a nurse. Having your child switch majors mid-way through college not only causes them to stay longer in college but cost more money and time, long-term. 4) OPTIMIZE YOUR HOME EQUITY! – By restructuring your mortgage, you can optimize the full value of your home. I know this sounds a little counter-intuitive because the first thing that traditional financial planning wisdom has told you was pay off your home! However, in the last 3 years and dealing with this recession, how has following that wisdom panned out for you? Chances are you LOST your home equity due to declining real estate prices and you NEVER harvested that equity when you could have. But, if you still have an equity line of credit, a little bit of home equity left or happen to purchase a foreclosure property where the house is pregnant with equity…here’s your second chance to maximizing your greatest asset. By taking control of your home equity, you may be able to increase your tax deductions, free up cash flow, save money by pre-paying college expenses and just have general peace of mind that your money is in your hands! Lastly, for some private colleges who use the CSS Profile in determining your eligibility for financial aid, large amounts of home equity can actually disqualify you! In light of what is going on in our economy, there is still hope. Don’t let the media turn your days of glory into days of fear. 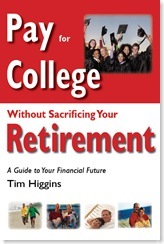 I hope you understand that planning for college, retirement and other aspects of your financial life are all TIED TOGETHER to your overall plan. The steps you take today will determine how your reach your God-given purpose and destiny. I hope you join me in helping set up a nation for financial success, rather than financial failure. We have put together an awesome two-part webinar series with two of the nation’s top college planning experts. This will be held on two-separate evenings, August 4th and 6th, 2009 @ 8pm EST/5pm PST (7pm CST and 6 MST). Details of this can be found on by clicking HERE. Lastly, a BONUS! You will also receive a private, 1-on-1 interview I conducted with Jon Belles of College Funding Solutions – a leading college planning provider in the US via a MP3 download. In case you missed this webinar series, you can still purchase this special Money for College hosted by Money Smart Radio by continuing to register and following the links you receive in your email.